* The RGB LED strip lights need additional adaptor and RGB controller fOR installation and make it work. * Easy for installation. Just connect all parts and stick it with the adhesive tape on the back of light strip. It can be cut and re-connected according to your need. * The LED light strip has 300 LEDs in 16.4ft, so the effect is more plentiful compared to 150 LEDs strip. * * * If with 44-key controller, it can bring 24 static single colors and 6 types of dynamic color changing effect. You can also make simple DIY program. * The required power supply is DC 12V ,we have both waterproof and non waterproof driver for your choice, so it can be safely used for indoor and outdoor application, such as kitchen, cabinet, dining room, bedroom, garden, balcony, party, wedding, holiday decor, etc. * 2 years warranty, lifetime technical support, no-worry purchase. Please make sure the surface of wall or other objects is dry and smooth. Before sticking, it is better to make strip warm. * Don’t you think that your room and your office are a little bit common and monotonous? -The 5050 SMD RGB LED Strip Lights really surprise you. Just stick it to wherever you like and you will find that RGB light brightens your room and makes the room a stylish one. We hope that it can provide you the best possible experience for lighting and decoration. 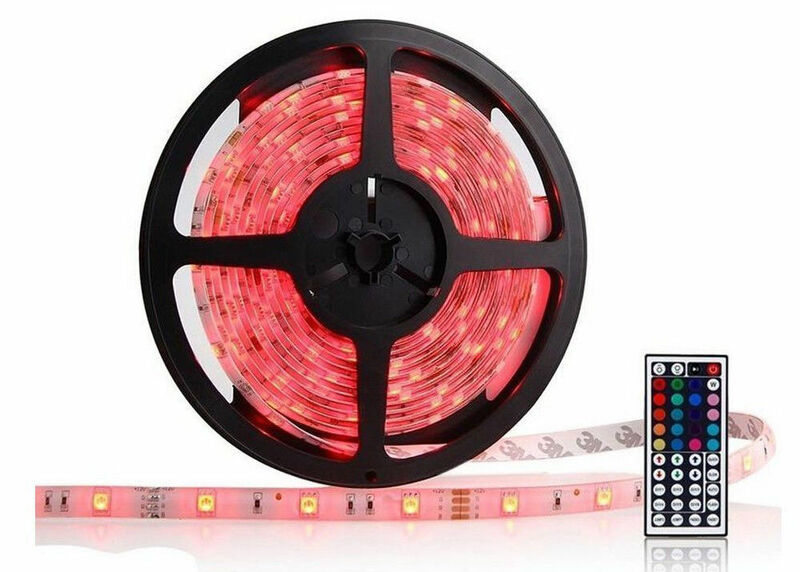 * Is this RGB LED strip light an eco-friendly one? -YES! With long life span of 50,000 hours and low power consumption, it is absolutely an eco-friendly one, saving your electricity while giving you a long time experience. You just can’t beat the benefits! * Here some suggestions to follow. 1. Do not use 220V voltage because it will burn. 2. The RGB LED strip light will light up when it is connected with 12V power supply, easy to operate. 3. Although it is a waterproof one, we still warmly suggests you to protect the connector with adhesive tape to avoid water and do not soak it in the water.